Major sporting events like the Olympics and the FIFA World Cup happen every four years and are entirely held in one area. While they provide a showcase of the greatest athletes, these events create too much waste with abandoned facilities. 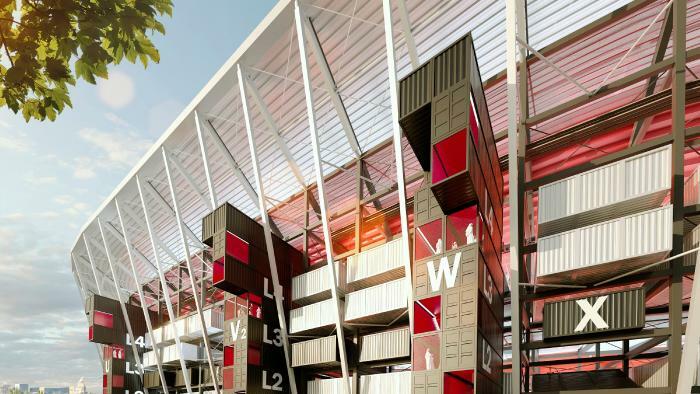 In order to help fix this issue, the host of the 2022 World Cup is planning to build a stadium from recycled shipping containers. Every four years, these major events require facilities to play the games, host athletes, and the media members covering them for an extended period of time. This results in temporary housing and new stadiums that promise to boost the economy. However, there’s many examples of these structures never being used again and are left to rot. It’s recently happened in Brazil after hosting the World Cup and the Olympics in the last three years. It only makes sense to install more temporary structures that can be disassembled at a later date if the community isn’t going to use them. This has led to Qatar, the future hosts of the 2022 World Cup, building the Ras Abu Aboud Stadium out of modular blocks. These are shipping containers that can easily be deconstructed and assembled for another area, or it can be broken down into multiple venues. The Ras Abu Aboud Stadium design was unveiled by the Supreme Committee for Delivery and Legacy (SC). It’s the seventh stadium design for the World Cup in Qatar. Each modular block will be customized with removable seats, concession stands, and bathrooms. This method both creates less waste while lowering the carbon footprint during construction. The 40,000 seater Ras Abu Aboud Stadium is the 7th 🌏🏆🏟design launched ahead of the 2022 FIFA World Cup in 🇶🇦. It will be the first-ever FIFA World Cup stadium capable of being reassembled on another site or turned into multiple smaller venues afterwards. With its eco-friendly features, the Global Sustainability Assessment System (GSAS) could give it a four-star certification. FIFA’s sustainability department will now be focusing on design, build, and operations when it comes to future hosts bidding for a World Cup event. New structures will be required to meet GSAS standards. This will generate some positive press from Qatar after what has been a controversial situation with these stadiums being built. The Human Rights Watch (HRW) believed that migrant construction workers were put in “potentially life-threatening heat and humidity.” While the government set specific times to keep workers away from the heat, the HRW said they needed to monitor temperatures closer instead of using set dates. Ras Abu Aboud Stadium is expected to be completed by 2020, well in advance of the World Cup. It will seat approximately 40,000 people and it will be located on the shore of Southeast Doha. The Hamad International Airport will be just one mile from the facility.